martial artist, linguist, historian and tireless arms and armour researcher, Dr. Manouchehr Moshtagh Khorasani (Germany) is an award-winning author who won the prestigious awards of the Book Prize of the Islamic Republic of Iran (2012) for his book Lexicon of Arms and Armor from Iran: A Study of Symbols and Terminology and Arms and Armor from Iran: The Bronze Age to the End of the Qajar Period(2009), which also won the World Book Prize in the field of Iranian Studies in 2009. The latter book is based on over 800 primary and secondary sources and features a detailed analysis of over 520 artifacts from ten Iranian museums for the first time. Some selected items from private collections are also featured in this book. Dr. Khorasani is also the author of the book Antique Oriental and Arab Weapons and Armour: The Streshinskiy Collection (published 2010) and has written well over 100 print articles, lexicon entries and book contributions related to arms and armor from Iran in 30 print journals and magazines, an encyclopedia and one in a book in English, German, Spanish, French and Persian for American, Argentinian, Austrian, British, Canadian, French, German, Indian, Iranian, South Korean and Spanish magazines. We have known Dr. Khorasani for many years in his role as a moderator and consultant at Swordforum International, and were particularly excited when we learned that he had been combining all of his passions and backgrounds in a new project: Razmafzar – Persian Martial Arts. His latest book, Persian Archery and Swordsmanship: The Martial Arts of Iran, is the first publication of his results, another massive, meticulously documented analysis of artifacts, artwork, and literature, this time cross-analyzed with surviving Persian fencing, archery and riding manuscripts and the many living-traditions of Iranian wrestling. We are pleased to offer this interview, where Dr. Khorasani gives us some insights into the (re)development of Razmafzar, living martial traditions in Iran, and what is forthcoming from his prolific pen. Shamshir and Separ (Buckler) vs Mace and Buckler. In Razmafzar the small shield (separ) is used with a variety of weapons, including the sword, mace, axe and dagger. FAP: In the simplest terms, what is “Razmafzar”? Where does the name originate? What fighting disciplines does it entail? Khorasani: This is a combined Persian term, a New Persian lexeme which consists of razm (battle/fight) and afzar (tools/weapons). It means “Battle Weapons”. Actually, this word is related to zinabzar or zinafzar which means the weapons for a mounted warrior. The term zinafzar can already be found in the Poems of Onsori Balkhi (1990, p.22). This word is an old word which derives from the Middle Persian word zēn afzār (war implements/weapons) that can be found in Karnameye Ardeshir Babakan (see Farahvashi, 2007, p. 30). The reason for choosing razmafzar and not zinafzar for this historical martial art is that it deals not only with cavalry techniques and tactics but also with infantry techniques and tactics. So it is a more general term encomassing both fields. Although the fomer has received some cursory look, the latter has been completely ignored in the studies of martial hertitage of Iran/Persia. It entails all techniques which are documented in manuscripts, poems, battlefield accounts, miniatures, arts, stone reliefs from Ancient Iran and also Islamic period of Iran. FAP: You had already established your reputation as a researcher into Persian arms and armour? How did you come to turn your attention to Persian fighting arts? Khorasani: I have been an active martial artist almost all my life and surely after years of research, measurement and recording hundreds of Iranian arms and armor in 14 museums in Iran and many private collections in Europe, Russia and USA, the intriguing question has always been how these weapons were used. That is why I turned my attention to a detailed study of these weapons. FAP: One of the unique things in Persian Archery and Swordsmanship is your detail to language – in tracking a lexicon of martial terminology or technical vocabulary, that can be found in non technical literature and then comparing that to iconographic depictions of the same actions. 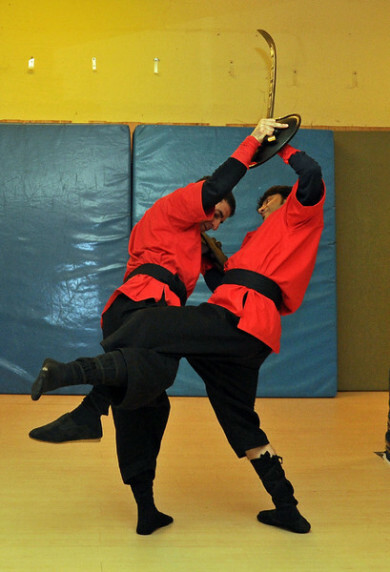 This is an area that is still awaiting more serious attention in Historical European Martial Arts (HEMA). Can you discuss the process you used in going about this? Khorasani: Thanks for asking this question. I started my research first by writing a book on classification of Iranian weapons from Ancient Iran up to the end of the Qajar period in 1925. The result was the publication of my book “Arms and Armor from Iran: The Bronze Age to the End of the Qajar Period” in 2006. After that I turned my attention to translating and annotating many Persian manuscripts, which have been scanned for me by Iranian museums and libraries. These included manuscripts on making Persian crucible steel (up to that time all unknown in the western world), archery manuscripts (5 of them published in my last book), manuscripts on lance, spear, swordfighting and manuscripts on war wrestling. As an English major, as I have a PhD in English language, languages and their academic study have always been a central area of concentration for my research and analysis. I have lived and studied in different countries and hence learned different languages (English, German and Spanish) as my academic fields. Therefore, I felt that I had to extend my area of research and study battlefield accounts, poems, stories and also popular tales. To my surprise, I found terms and expressions for techniques such as “shamshir bar farq zadan: To strike the top of the head”. I saw this expression in many manuscripts in many centuries. Then I analyzed miniatures and was extremely surprised to see how often this technique was used. Quite often I must say. Then other combinations followed. I went back and saw that even in Ancient Iran, this technique was used. I mean in iconogrphy of Sasanid period. Then I found how manuscripts and even poems describe this technique and how it should be applied. I made a comparative analysis. I did it for all techniques I could find in hundred manuscripts. Many of them handwritten manuscripts which were scanned. A meticulous and painstaking process. It took very long. At the end I found 5700 lexemes and then tried to find the relationship to iconographic items. First I published my lexicon “Lexicon of Arms and Armor from Iran: A Study of Symbols and Terminology” in 2010 and then my last book this year “Persian Archery and Swordsmanship: Historical Martial Arts of Iran”. FAP: HEMA practitioners are fortunate in having a a larger number of technical works, “fight books”, on which to base their reconstruction. Is there a similar body of Persian martial texts to draw from? Khorasani: Yes, there are. I have presented many complete manuals in my last book. Five complete ones on Persian archery. One on mounted lance fighting. One on spearfighting on foot. Three on war wrestling. One on swords. As we are talking, I have received some new ones. This area has been neglected for years. 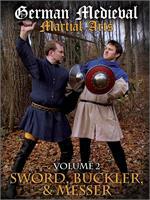 I have received new manuscripts on archery, swordsmanship, mounted combat, etc. FAP: In the West, many traditional martial arts, particularly “aristocratic” or “chivalric” ones became extinct in the 18th and 19th centuries, and have had to be reconstructed. How does this compare to the situation in Iran? Have you been able to find living sword or weapon arts, and if so, have they played a role in creating modern Razmafzar? Khorasani: Chivalric code of Iran is best expressed in the Javanmardi code which is similar to European chivalric code or Japanese bushido. We have a living tradition of Zurkhane (House of Strength). Wrestling in Iran is considered as a sacred sport, where the mat is still considered a place to respect and to be respected and one needs to show humbleness and also help people in need. My project of Razmafzar is based on academic reconstruction of techniques in manuscripts, miniatures and reliefs. But it does not stop there. As I have shown in my last book, the tenets and training methods of the House of Strength will be integrated in it. Additionally, we have over 24 styles of traditional wrestling in Iran, we have sword dancing, we have different stick fighting methods in Iran. They are in the process of being researched. We will make comparative analysis and then set up a big data bank and integrate them in Razmafzar as well. Wrestling remains an important sport, fighting tradition and cultural treasure in Iranian culture even today, and was considered the basis of Persian warrior training. FAP: At the same time, there are many European folk traditions, particularly for wrestling and stick or knife fighting, that have survived. In Persian Archery and Swordsmanship you touch on this with traditional Iranian wrestling or Varzesh Pahlavani. Can you tell us a little about Pahlavani – both as it exists now and as it might have related to earlier Persian fighting arts? Khorasani: The House of Strength symbolizes a sacred place where practitioners not only develop strength, but they need to learn javanmardi rules. They need to be role models for the young generation. 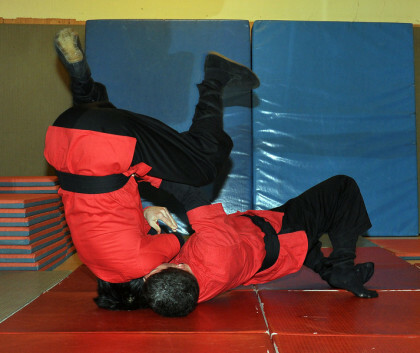 Wrestling is one of the most effective combat systems as proven again and again. This plays a major role in Iran. FAP: Have you yourself trained in Varzesh Pahlavani yourself? Have any modern Pahlavans been interested in your work with Razmafzar? Khorasani: Yes I am fortunate enough to be in contact with leading pahlavans in Iran and I trained and even documented their training in the House of Strength. They are greatly interested in Razmafzar. FAP: Before you began reconstructing Razmafzar, did you already have a previous martial arts background? If so, in what? How has it helped with your redevelopment of Razmafzar? Khorasani: Yes, without name dropping, my students and friends know that. I hold three black belts, a 4th dan in one of them, the others 2nd dan. I have trained and competed in many full-contact sports such as boxing, Muay Thai and of course wrestling. I experimented with BJJ and trained in a team. Besides I also trained in a Japanese Koryu sword art extensively. But I have always wrestled and love this sport. Wrestling has helped me the most, as this is the tenet of Persian armored and unarmored fight. But I have to say that all martial arts and fighting I have done have played a part, by helping me universal principles of combat, like distance and lines of attack and defence. I have to say I love realistic and full-contact sparring and think that is important in all martial arts, including swordfighting. A Persian warrior should be able to grab and throw in close range at anytime. And then of course to deliver fast and powerful blows with his weapons. FAP: Persia has long been a cross-roads between the Mid and Far east. Have you found commonalities between Persian arts with those of the Arabs to the West or Indians, such as the Sikh Gatka or Shastar Vidiya to the East? Khorasani: Well possibly, but as I have not trained in Indian or Arab arts, I cannot pass judgments. What I can say is that there always commonalities with certain arts, especially when the arms and armour are similar, but I would say that what I know defines Persian arts is an emphasis on developing strength, stamina, power and only then techniques. This is why wrestling plays a crucial role – it trains the body that is at the core of the entire art. A Persian warrior should be able to grab and throw in close range at anytime. And then of course to deliver fast and powerful blows with his weapons. FAP: You have chosen to create an international research and development team to develop Razmafzar. Can you tell us a bit about who comprises the team and how your team works together? 1) Mr. Bede Dwyer from Australia is a leading researcher on Asian composite bow. Bede has published many articles in many leading academic journals. He plays a very important role in Razmafzar team. He has been my editor from 2004 and has made useful comments on archery sections on my books. We have written many important articles on Persian archery based on Persian archery manuscripts which have been translated by me. At the moment, I am planning to write a book on Persian archery together with Mr. Bede Dwyer on Persian archery. This book will not only comprise archery techniques and annotated archery texts but we will show techniques and how to execute them with a replica Persian composite bow. 2) Mr. Ali Ghourchani from Iran is an accomplished horse archer who has gained many places in international horse archery competitions. I will test many horseback wrestling and horseback lance and swordfighting in cooperation with Ali. He is an accomplished horse archer. 3) Mr. Heiko Grosse from Germany is an accomplished swordsman who has been training and learning razmafzar under my direct supervision. He is a black belt in kendo with ten years experience in Kendo competitions and a Cateran and an expert in Scottish swordsmanship with five-year experience. He plays a pivotal role in learning and teaching Razmafzar. 4) Ms. Mitra Haji is a Museum Curator of Bonyad Museums from Tehran, Iran. I have been working with Ms. Haji over 7 years. I have analyzed over 500 historical arms and armor from Iran which are kept in Bonyad Museum. She has translated and edited many of my articles in Persian. We organized two historical arms and armor exhibitions “The Power of Iranian Steel” and “Weapons and Combat in the Shahname” in Tehran. 6) Mr. Richard Nable is a police Lieutenant for a metropolitan police department in the Southeastern United States. He is a SWAT sniper and team leader, department rangemaster, and instructor primarily in police weapons, tactics and survival. Richard is our advisor on the mechanisms of historical firearms and has edited a number of articles on historical firearms which I have written and also has been editing parts of my books. 7) Mr. Greg Thomas Obach has been on my team for over 12 years. Greg is a leading and very experienced smith who makes wonderful crucible steel. He has edited the chapters on crucible steel in my books and also articles. His insights into making crucible steel and above all his down-to-earth approach and willingness to learn and experiment make him truly a unique smith. 8) Ms. Venous Pirmomen from Iran is an archaeologist with a Master and a Bachelor degree in archaeology from Islamic Azad University. Her areas of interest and concentration are bio-archaeology, biological anthropology and forensic anthropology. She has played an important role in accessing data for research of Razmafzar team and public relations in Iranian universities. She has found many new manuscripts from Iranian libraries and museums for primary research materials on Persian arms and armor. 9) Mr. Hessamoddin Shafeianis a PhD Candidate at University of California, Riverside in the field of Electrical Engineering Department. He obtained his MSc degree from the prestigeous Sharif University of Technology. He has been a very important team member with unflagging determination to find and access data which are extremely important for the research of Razmafzar team. Together with Venous, Hessam has found and gained access to many important Persian manuscripts. 10) Dr. Denis Toichkin from Ukraine is a leading arms and armor historian and researcher and the author of a book on the history of Cossack cold steel. He is recognized as a specialist in the late medieval and modern history of Eastern European arms and armor. He has published on Persian arms with me in leading Ukranian journals and we are going to publish further articles on Persian arms and armor in future. He plays a pivotal role in arms and armor research in our team. FAP: Razmafzar is a large, complex art. When a new student wishes to begin training, where do they start? What are the root disciplines of the system? Khorasani: They will learn sword and shield combinations and spear combinations on foot first. Accompanied by wrestling techniques of course. War wrestling based on Persian manuscripts play an important role in Razmafzar. Persian manuscripts stress that a good warrior is a good wrestler. Then we move to dagger and knife fighting in combination with a shield. Then axe and mace techniques are taught. More complex techniques of sword and shield and wrestling always accompany the curriculum. 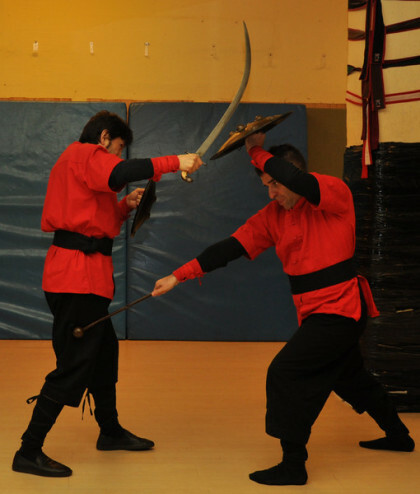 Then short sword techniques qame and qaddare as civilian weapons follow as the former are battlefield weapons. The whole would take 4-5 years to master. Then they learn archery on foot and then horse archery. The last step will be fighting with weapons and wrestling on horseback. The whole techniques comprise all techniques from ancient Iran into Islamic period. Of course as far as they are evidenced. We do not make up techniques. But Razmafzar deals with all periods of Iran. Participants should also learn about some aspects of historical arms and armor from Iran as well. FAP: You’ve created the largest single source on Persian Arms and Armour, a companion lexicon, and now a giant overview of Persian martial arts and martial culture. All in your spare time! So what is next for Manouchehr Khorasani and Razmafzar? Khorasani: Thanks for asking! My next project is finishing my book on historical firearms from Iran. This book contains translated and annotated Persian texts on cannon making, rockets, etc. I have also measured and pictured over 100 unique examples of Persian firearms from Iranian museums. A treasure. I have been classifying and researching all techniques of traditional wrestling arts of Iran. These will be published in different books by me. I am also planning a book on armored combat and horse combat in Persian tradition. And of course together with Mr. Dwyer we are writing a book on Persian archery. Thanks for the interview. Freelance Academy Press is proud to be distributing Dr. Khorasani’s books here in the United States, and look forward to working with him in the future on other projects.